84-year-old rabbi served for three decades as Yeshivat Hakotel head in Jewish Quarter, taught thousands; Funeral date not yet determined. 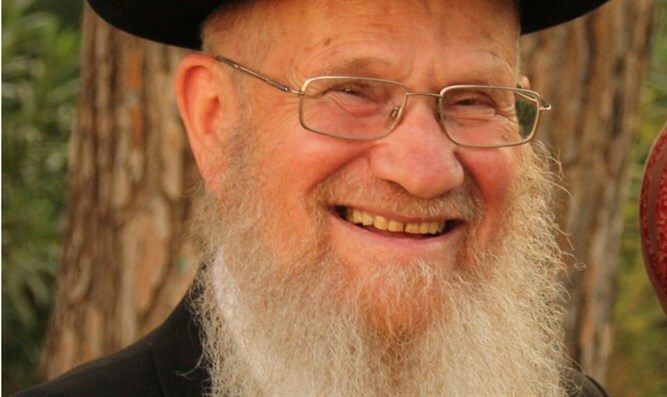 Rabbi Yeshayahu Chaim Hadari, who headed Yeshivat Hakotel for 30 years, passed away this morning at Shaare Zedek Medical Center in Jerusalem. The 84-year-old rabbi, a resident of Jerusalem's Jewish Quarter, was hospitalized yesterday in very serious condition after falling at home and sustaining a head injury. The rabbi left behind his wife Naomi, three daughters, and many grandchildren and great-grandchildren. The date of his funeral has not yet been determined. "The ark of G-d has been overcome," said Yeshivat Hakotel. "Our Rabbi and teacher Rabbi Chaim Yeshayahu Hadari zt"l, the Rosh Yeshivah, the yeshiva's founder and president has ascended in a storm to the heavens. We all grieve and mourn and weep bitterly." The rabbi was born in Tel Aviv and in his youth studied at the Bilu School and at Yeshivat HaYishuv HaChadash in the city. Later on, he studied at Yeshivat Hevron in Jerusalem and was close to Rabbi Zvi Yehuda Hacohen Kook and Rabbi David Cohen, the "Rav HaNazir". After his marriage to Naomi Rakover, the rabbi served as supervisor at the Kerem B'Yavneh Yeshiva for about three years. During the 60's and 70's, he gave Torah talks on Kol Yisrael radio. He also taught for years at Michlalah Jerusalem College for Women. Shortly after the liberation of Jerusalem's Old City, the rabbi was called to head Yeshivat HaKotel. In 1998, Rabbi Hadari retired from his position and began to dedicate most of his time to studying, contemplating, and writing. He was succeeded by Rabbi Chaim Katz and later by Rabbi Mordechai Alon. After Rabbi Elon's retirement, Rabbi Hadari returned to serve as head of the yeshiva for two years, until Rabbi Baruch Weider was appointed. Four years ago, Rabbi Hadari received the Yakir of Jerusalem award for outstanding Jerusalem personalities.